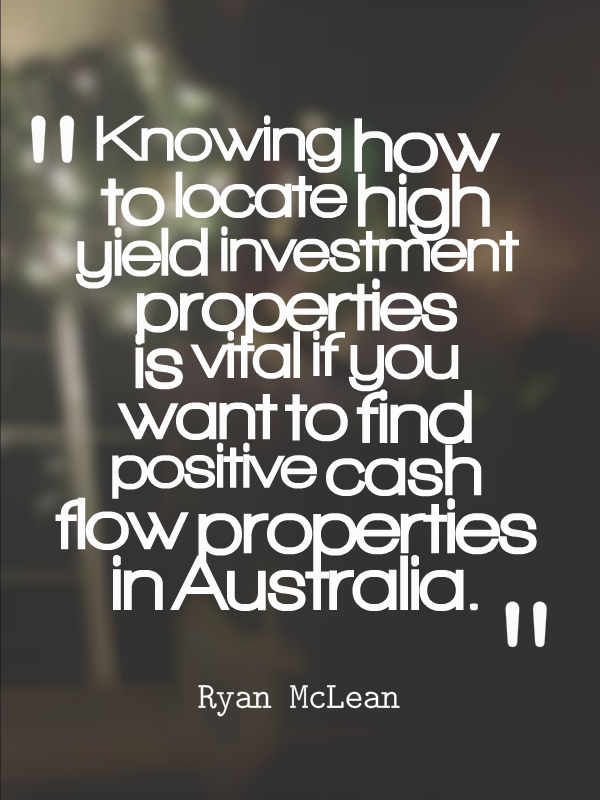 Knowing how to locate high yield investment properties is vital if you want to find positive cash flow properties in Australia. High yield investment properties are the ones that generate a great rental income and will likely cover your mortgage and expenses with some money leftover. So how do we locate these high yield investment properties? You need to understand what a rental yield is and be able to calculate it before you can search for them. You can use a tool like our free gross rental yield calculator on the website. To calculate rental yield you need to multiply the weekly rent of the property by 52 – fifty-two weeks in a year – and then divide that number by the purchase price. That will give you your rental yield. Another really simple method is to look at the price of your property and remove the last three zeros. Compare this number to the weekly rent of the property. The rental yield would be 5.2% if the rent is exactly equal to that figure that you’ve got. The rental yield would be 10.4% if the rent is double of that figure. And if it’s somewhere between or below those figures you can work it out from there. Understanding what a rental yield is – what’s goods and bad, what’s high and low – will put you in better stead to find high rental yield properties. Generally a high rental yield property is above the 8% rental yield mark. The different ranges consider 2-4% to be low, 5-7% to be medium and 8-12% and above to be a high rental yield. Use real estate investing magazines to look for the medium rental yields of an area. I created a video on this that you can check out. I show you step by step exactly how you can use a property magazine to find high rental yield suburbs. But basically you need to flip to the back of the magazine and check out the stats. It gives you a stat on the rental yields for houses for each individual suburb. You can then look through that and see which ones are high and which ones are low. Dual income properties include places with granny flats or duplexes on one title or houses that have been split in two. These dual income properties generally have higher rental yields than single income properties because you’re getting two rental incomes. Look out for them and your chances of achieving a higher rental yield increase significantly. Look at country towns or rural town centres. Think of places like Dubbo or Parkes or Bathurst in New South Wales. Moving out of capital cities means that the prices of properties tend to go down because the demand for living there is not as high. And then the rental yields for properties tend to go up as well. You can also look at mining towns if you want to easily find high rental yields. But you’re going to be paying a premium price for that property because of the supply and demand. There is so much demand caused by all the miners coming in and not enough supply. You just need to be careful if the mine closes down. The workers would leave and the town may shut down and your investment property could be worth a fraction of what you paid for it. I recommend a property tool called “Real Estate Investar“. Real Estate Investar basically acts as the Google of property search in Australia. It allows you to search for keys words like “granny flat” or “11% rental yield”. 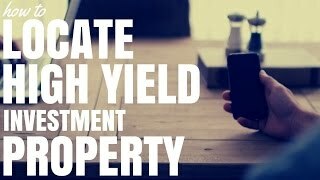 This will help you distinguish high rental yield properties. It will then pull out the listings that have those key words and allow you to look through them. Your chances of finding high rental yield property will be significantly increased if you’re using a tool like Real Estate Investar instead of a free site like realestate.com.au or domain.com.au. It is a paid tool and it is quite expensive. But it is an excellent tool if you want to find those high rental yield properties. You may just want to use it for a month or sign up for a full year. You can check out Real Estate Investar’s free webinar by going to pca.im/freewebinar. That’s an affiliate link that will help out Positive Cash Flow Australia but won’t cost you any extra. At the end of the webinar they give you some discount codes so you can get it for cheaper if you attend that. Just because a property has a high rental yield doesn’t mean that it’s going to be a good investment. And a low rental yield doesn’t mean it’s going to be a good investment either. Always do your research on the property and on the area to find out whether this is an area that’s going to grow. Know whether or not your property is going to perform and meet up with the financial goals that you want to achieve. Positive Cash Flow Academy is my website. It is a paid product where I teach you exactly the techniques that I use to find positive cash flow properties all over Australia. I go into much more detail. It’s a step-by-step guide on how you can find high rental yield properties and positive cash flow properties. So check that out! So I hope these tips have helped you to understand how you can locate high rental yield properties.